"The Only Thing That Counts"
PAUL, APOSTLE OF CHRIST is a profound, inspiring movie experience about Paul’s last days in a Roman prison as Luke comes to visit Paul and bring some money to a hidden group of Roman Christians suffering under Nero’s persecution. The movie opens in A.D. 67 in Rome. A title card says the Emperor Nero has blamed Christians for starting the fire in A.D. 64 that burned 70% of the city. He started killing them in the arena, sometimes by feeding them to lions or wild dogs, as well as using their bodies as human torches on the Roman streets. Roman troops are still looking for Christians to imprison and kill in A.D. 67, but Luke, a companion of Paul during his missionary trips, has secretly entered the city to try to visit Paul, who’s been imprisoned and condemned to be beheaded. Luke also comes bearing some money from the churches in Asia Minor to help a small community of Christians hiding from Nero’s wrath and led by Aquila and Priscilla. Originally from Rome, Aquila and Priscilla years ago had helped Paul establish churches in Corinth and Ephesus. They returned to Rome at some point with Paul to help lead the Christian community there. As Luke arrives at their hiding place, he learns Aquila, Priscilla and the Christians they lead are debating whether to stay in Rome or try to leave the city secretly. With their help, Luke is able to bribe a guard in the prison so Luke can talk with Paul and pick up another letter from him to deliver to the Christians in Asia Minor or Rome. In the prison, Paul is still haunted by the brutal persecution he led against Christians before he converted, even though he knows he’s been forgiven through Christ. When he and Luke talk, they decide Luke will write a book about Paul’s missionary work, based on conversations with Paul. The prison warden finds out about the book and decides to imprison Luke too. Meanwhile, a young Roman convert is angry about the continued persecution of Christians. When a young teenage Christian messenger is caught and murdered by Roman soldiers, he wants to lead a violent revolt against the Romans and free Paul and Luke from prison. However, Priscilla and Aquila remind him that love is the proper Christian response to such persecution, as Jesus directly instructed His apostles and disciples. Will the young man go through with his rebellion? Will Luke be able to finish his new book before the Romans decide to kill him and Paul? Or, will Luke and Paul be rescued? PAUL, APOSTLE OF CHRIST has a great professional cast. Jim Caviezel of PASSION OF THE CHRIST and TV’s PERSON OF INTEREST stars as Luke. James Faulkner of GAMES OF THRONE and DOWNTON ABBEY stars as Paul. Joanne Whalley of A.D. THE BIBLE CONTINUES and WILLOW plays Priscilla. Olivier Martinez, who gave a striking performance as Mexico’s General Santa Ana in A&E’s interesting miniseries TEXAS RISING about the fight for the independence of Texas in 1836, plays the prison warden, whose daughter is deathly ill but who refuses to go to the Christians for help. The acting is superb throughout PAUL, APOSTLE OF CHRIST. It really is one of the best-acted movies about Jesus Christ, His disciples or the Early Christians. Also, despite some talky parts, the dialogue is brilliantly written and beautifully uses a few passages from the Book of Acts and other books of the Bible and many passages from Paul’s epistles or letters to punctuate the plot. Finally, the second and third acts lead to an inspiring, riveting and profound climax and ending that will motivate viewers to learn more about the New Testament, the Gospel of Jesus Christ, the meaning of Christian faith, and how to live a Christian life. The movie’s biggest flaw, perhaps, is that the premise and plot in the first act aren’t quite clear or direct as they should be. Thus, although the movie makes it perfectly clear from the beginning that this is an extremely dangerous time for Christians in Rome, it isn’t until the second act that the movie truly reveals what direction the plot is really headed and what the movie’s premise and primary message are. Thus, the movie informs viewers almost right away that the Christians who have survived Nero’s persecution so far are wondering whether they should stay in Rome and continue to spread Christ’s Gospel or to flee the city and continue their evangelism elsewhere. Despite this, it’s unclear how Paul, or even Luke, fits into this decision. Then, however, by the time of the second act, the question in the movie becomes not whether they should stay in Rome or leave, but how should they, including Paul, respond to the Roman persecution, which is senseless as well as cruel. It’s at this point, in the second and third acts, that the movie truly begins to reveal its premise and its primary message. Thus, in answering the question What should be a Christian’s response to persecution, especially violent and cruel persecution, the movie clearly says, Love is the proper response. Similarly, the premise of the movie ends up being the proposition that Love softens people’s hearts. A couple corollaries to this main premise and this main message are 1. Obey God or Jesus Christ rather than follow the desires of your heart and 2. Kindness is also a proper response when faced with persecution. Engaging and ultimately absorbing, PAUL, APOSTLE OF CHRIST is not a directly evangelistic movie. There are no altar calls, for example. However, it’s a must-see, well-crafted, soul-stirring movie with a strong Christian, biblical worldview that imparts valuable, inspiring, profound Christian messages. After experiencing it, media-wise viewers will see (and hopefully find) many great opportunities to use this movie to explore the lives of the biblical characters depicted in the movie and conduct further studies into the Gospel message that Jesus, Paul and Luke present in the New Testament documents. The words of Jesus in the New Testament enlighten and transform all people, and the writings of Luke and Paul in the New Testament are themselves an endless treasure trove of God’s philosophical, spiritual and moral truth. Caution is advised for older children because of brief violent images. – Paul, Apostle of Christ, Galatians 5:6, NIV. Nothing else really objectionable, though one character decides to ignore the Christian message of love and fight against the brutal persecution of Christians by the Romans under Nero. 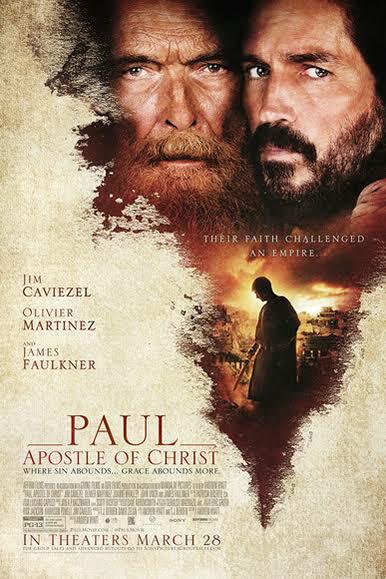 PAUL, APOSTLE OF CHRIST is a profound, inspiring movie about Paul’s last days in a Roman prison. In A.D. 67, Paul’s friend Luke sneaks into Rome, where Nero is still persecuting Christians. A secret enclave of Christians bribes a guard so Luke can visit Paul, who’s scheduled to be executed soon. While talking to Paul, Luke begins writing about Paul’s conversion and missionary travels. However, the warden finds out and imprisons Luke too. Meanwhile, an argument breaks out among the Christians about how they should respond to the intense Roman cruelty. The acting is superb throughout PAUL, APOSTLE OF CHRIST. Also, despite some talky moments, the dialogue is brilliantly written and beautifully uses a few passages from Jesus in the Gospels and Paul’s letters in the Bible. The movie’s first act is a little slow and not as clear as it could be, but the second and third acts are great. PAUL, APOSTLE OF CHRIST is a must-see, well-crafted, soul-stirring movie with a strong Christian worldview teaching that Christian love can soften hearts. Caution is advised for older children for some violent images.